In a recent Data Bank feature we brought you a selection of new and nearly-new cars ideal for younger drivers. That was all well and good for those with money to spare, but most learners will be on a limited budget when it comes to choosing their first set of wheels. To that end we’ve turned to the cars for sale section, and, armed with an imaginary £1000 we’ve chosen a selection of first cars for those with a more modest, realistic budget. It’s tricky to find a £1000 car that ticks all of the right boxes – cheap tax, cheap insurance, reliability, cheap maintenance, style, and decent fuel economy – but if you look hard enough you can at least tick a few, so read on for our top five. The Ka is a familiar sight on UK roads. It was first introduced in 1996, when its quirky looks were much more radical than they appear today, but it caught on well. Its enduring popularity meant that Ford continued to improve it over its lifetime, and it was sold right up until 2008. Couple its popularity with its longevity and it’s easy to see why there are so many for sale. Earlier models are starting to show their age now, with tired engines and paintwork, so it’s better to spend a little bit more and get a recent model. Parts are usually cheap, so if anything goes wrong it shouldn’t cost too much to put right, and insurance isn’t too bad. We got a third party, fire and theft quote of £1622 per year for a newly qualified 17-year-old girl living in a small town, with her self-employed, 40-year-old father as a named driver on the policy. In our classifieds section we found a 2001 51-plata Ka with 87,000 miles and a full years MOT for £975. It’s sparsely equipped, but creature comforts are hard to come by at this price. Another enduringly popular model, the Corsa is popular with everyone from driving instructors to small families. Three generations of Corsa have been sold in the UK, the earliest from 1993-2000. This first generation model falls into the sub-£1000 category. There are numerous engines offered, which is a blessing for many buyers but a curse for young drivers, because insurance costs rise as engine capacity increases. The 1.0-litre 12V engine, while a little coarse and unrefined, is the cheapest on insurance, and thanks to a chain driven cam it doesn’t hide too many costs as the miles rack up. While the 12V engine might be fairly cheap to maintain, it is prone to exhaust failure, and as with any cars of this age it’s important to check for rust, damage, and worn out components like suspension. On the bright side, the Corsa 1.0-litre 12V is abundant and cheap – a 2000 X-reg, 80,000 mile model with a fresh service and MOT can be had for less than £1000. Insurance for our imaginary teenage girl came out as identical to the Ka. The Yaris is renowned for its reliability, with very few of the more common faults attributed to anything other than owner neglect. The original Yaris was sold from 1999-2005, and early ones are now available for around £1000. Most will be priced at slightly more, but it’s nothing a good haggler can’t fix. The best model for younger drivers is the 1.0-litre 16v. It's a chain driven engine, which is handy for keeping the maintenance budget down. Generally speaking, the Yaris proves fairly trouble free, but parts do wear out, so don’t go in blindly expecting 100% reliability. Insurance, once again, is almost exactly the same as the Ka and Corsa, although the cheapest quote was £1 less. 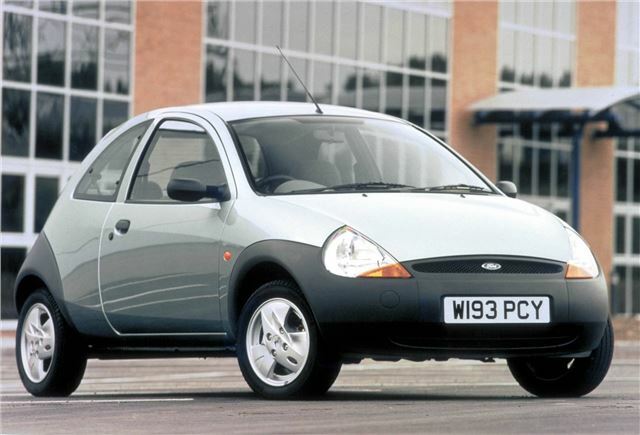 We found a 2000 X-reg with 85,000 miles for £995 with a full years MOT – but it did need a year’s tax. A modern looking car, the 206 was first introduced in 1998 and was sold until 2006, when it was replaced by the 207. While it’s never scored particularly well in reliability and customer satisfaction surveys, its low price and stylish looks make it a popular choice amongst new drivers. The smallest engine is the 1.1-litre, and so a lot of drivers will wrack their brains seeking one out, only to discover it’s rare and curiously expensive. It’s best to ignore this engine, though, as the 1.4-litre is as cheap to insure as anything else in this list. It’s a fairly sturdy engine with a history that can be traced back to the 1986 Citroen AX, and it tends to last a lot of miles. However it does suffer from a few sensor problems and the engine mounts are prone to wear, so don’t be afraid to poke around and ask specific questions. £1000 will, if you look hard enough, get you a 2002 model, with tax and MOT, in GLX trim, which includes alloy wheels and air-conditioning. The Micra is another car renowned - much like the Yaris - for its reliability. The mark two model was introduced in 1992 and was sold until 2002. It was given a facelift in 1998, and was offered with either 1.0-litre or a 1.3-litre 16V engine. The 1.0-litre is cheaper to insure, and a quote identical to the Yaris, Corsa and Ka was easy to find. The engine is the highlight of the Micra – it’s a very well built and with decent maintenance will last a long time. Its weakest point is its susceptibility to problems caused by dirty oil, so a good service history will most likely point to a reliable car. The only other weak point is the throttle body, which can get dirty if the car is never warmed up, so be wary of extremely low mileage models. Besides that the Micra is a fairly sensible first car choice, but as with all cheap used cars, look out for rust, wear and tear and damage. £1000 will get you 70,000 mile, 2002 model with a reasonable trim level, tax and MOT. Whatever car you decide you want, be careful. Look at a few rather than settling on the first you come across, and be thorough with your checks. A good service history will not only help provide some peace of mind when you buy, but it’ll maximise the amount you can sell the car for when you’ve moved on to something else. For more hints on tips on learning to drive and what to do after you’ve passed, visit our young drivers section, or visit our Facebook page.